Nice, was just about to ask if they were late for some reason. Gyou is on fire and they're preparing for the 14th day. Doesn't seem too eventful, but a breather was bound to happen after all the action we've been getting. If there's one thing that's all over the place in his art, it's the weapon size. Goes from the size of a small child to the size of a horse within a chapter. And the curve, sometimes it looks much more like a scythe despite not even being in motion. Feels like a very short chapter. Wonder what is Chougaryuu talking about. Seems like a few back and forth time jumps. 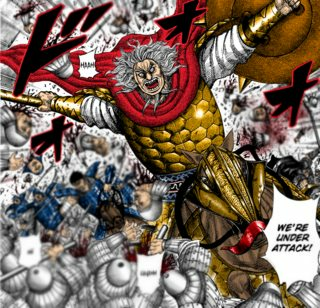 I think we'll reach the point where Gyou will starve at the exact same point as the HSU, so basically both sides will realise that it all comes down to the battle with Shin and co.
but last chapter it was said that this was the second significant development on the thirteenth night. how'd you figure there were time jumps? last page : ?? : General. shin’s army moved to center. idk english name : Yes.. I see. shin must have become a leader of ring wing. it is one of there plan. but I will finish in half a day. then that’s all. page 58 ?? : i have nothing to say at the moment... they are extinguising a fire desperately. but... lord : what..the... Did we lose our almost food overnight? 14 days ago man : Show me the list. You cant come in unless your name is on the list. Otherwise, step aside. I will check it later. old man : thas’s all today. man : Ok. come in. man next to injured : we did it. here is Gyou. Last edited by no name; 02-12-2019 at 06:28 PM. Last edited by no name; 02-12-2019 at 07:58 PM. Ousen inspiring that much loyalty just feels weird to me. Chougaryu finally gonna impose himself? They were always his soldiers and he always lead them to victory one way or another. You think that bond can be broken in just one battle? ousen just doesn't strike me as having an emotional bond with his soldiers whatsoever. Chougaryu is gonna become the "star" of Zhao's left wing today.